Maria Sharapova has only lost three matches in 2013. Two of those were against her longtime foe Serena Williams, but the other was a thorough 2 and 2 trashing at the hands of Li Na during the Australian Open semifinals. Maria Sharapova was the heavy favorite in that match, having dispatched all of her previous opponents with ease. Yet the Russian found herself at the losing end of a most impressive dismantling, to the surprise of many. Surely that match was in Sharapova’s mind today, as she beat Li Na in a rather straightforward affair, 6-4, 6-3 in the final of the Porsche Grand Prix, also known as the Stuttgart Premier. The match was tight and tense, but Li Na never found a way to get a lead in it, and she rarely threatened Sharapova’s serve (Li Na’s only break of serve came when Maria had gone up two breaks in the first set). – There were 33 Key Points played during the final. The now two-time Stuttgart champ won 19 of them. – Six Key Points (18% of the total) came in the seventh game of the first set, with Li Na serving down 2-4. The current Australian Open runner-up ended up holding serve, surviving one break point. – An astonishing 67% of Key Points were decided by Point-Ending Shots (Winners, Aces, Service Winners and Forced Errors). That’s a remarkable number, given that finals tend to be tense and nervy, which gets in the way of executing aggressive shots properly. – 73% of the Key Points in the second set came via Point-Ending Shots. That’s a very high number. – Only six Key Points were decided by clean winners or aces. Yet 16 were decided by Service Winners and Forced Errors. More evidence that the Winner stat on its own does not tell us nearly enough about the aggression displayed in a match, particularly if we’re talking about a clay court encounter. – There were nine Service Winners during Key Points throughout the match. Li Na was responsible for the majority of them (five). – Maria Sharapova won 68% of her Key Points via Point-Ending Shots. Li Na wasn’t far behind: 64% of her Key Points came via Point-Ending Shots. Nobody was in the giving mood, apparently. Notice a disparity going on here? Yes: Nine more Key Points were played on Li Na’s serve. This is never a good thing: it just indicates that Maria Sharapova was being way more effective with her return of serve than the Chinese No. 1 was. And that Maria Sharapova was having a better serving day than Li Na. Maria Sharapova actually improved from her performance yesterday (when she won 10 of 13 Game Points played on her serve), taking 80% of Game Points played on her delivery. That’s the mark of efficiency on serve, and a demoralizing trend for an opponent who can’t find ways to extend those service games. And just like yesterday, today Maria Sharapova played 22 fewer points on her serve than her opponent did on her own delivery. 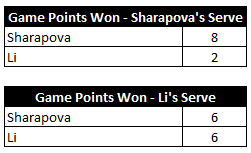 That’s a significant discrepancy, clearly illustrated by the fact that Sharapova won just as many Game Points as Li Na did on the former French Open champ’s own serve. But let’s go back to the eight Game Points played on Sharapova’s serve: only two of those were donated by Li Na unforced errors. 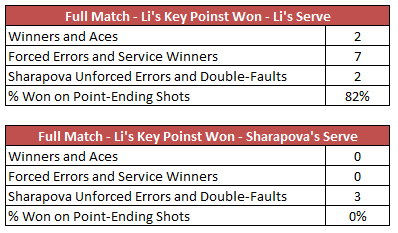 Four came via Service Winners, one came via a clean winner, and the remaining Key Point came via a forced error. This speaks to Sharapova’s very good serving performance today, as well as the aggression and efficiency she displayed whenever she had a chance to hold serve. The first box tells you how efficient Maria Sharapova was during return games: she only donated two Key Points to Li Na via unforced errors. 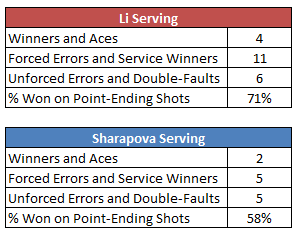 It’s also remarkable that Li Na won 82% of those Key Points via Point-Ending Shots. The second box tells a different story: Li Na was unable to take any Key Points on Maria Sharapova’s serve via Point-Ending Shots. In fact, she only won three Key Points throughout the whole match on Sharapova’s serve. And all three points were donated via unforced errors (one of them was a double-fault). This will probably annoy Sharapova slightly, but given she won the title and a Porsche, I’m not sure she’ll dwell on it for too long. – Maria Sharapova ended the match by winning the last five Key Points, which was the longest Key Points winning streak of the match. Only the last two came via unforced errors (the last Key Point of the match sadly ended in a Li Na double-fault). – Sharapova took three of the five clean winners on Key Points. Two were backhand winners – one down the line plus a gorgeous cross-court return winner – and one was a forehand down the line winner. – Both Li Na winners were of the forehand variety (one down the line and one cross-court). – Maria Sharapova had the only Ace of the match on a Key Point (it was down the T when facing break point at 15-40, 4-1). It proved to be for naught, as the Russian got broken on the very next point. – Maria Sharapova was responsible for forcing Li Na errors on five of the seven Key Points that ended that way. Again, another sign of Sharapova’s aggression. – In terms of Service Winners, Li Na was particularly effective with her wide serve from the Ad court: she took three of the five Service Winner Key Points using that serve. Something to note for the future. – Maria Sharapova was most effective with her serve up the T from the Ad court: she won two of her Service Winner Key Points on that delivery. – The four-time Slam champion was actually responsible for five of the nine Key Points that ended via Unforced Errors. Three of those were on the forehand side, which won’t surprise anybody. All in all, the numbers back up what we saw during today’s final: Maria Sharapova always looked like the player who was more likely to get an edge during the match, and her impressive performance is fully deserving of the scoreline. Maria was effective when serving (only had one bad service game in the entire match, and that came when she was already up two breaks in the first set), and even more dangerous with the return of serve. Li Na couldn’t find ways to boss Maria Sharapova around, and even though she managed to survive five break points on her own serve with good play (four of those were saved via Forced Errors/Service winners), she did get broken four times. It didn’t help matters that that the Chinese No. 1 only managed to generate two break chances – and both came in the same game, when she was down two breaks in the opening set at 1-4. 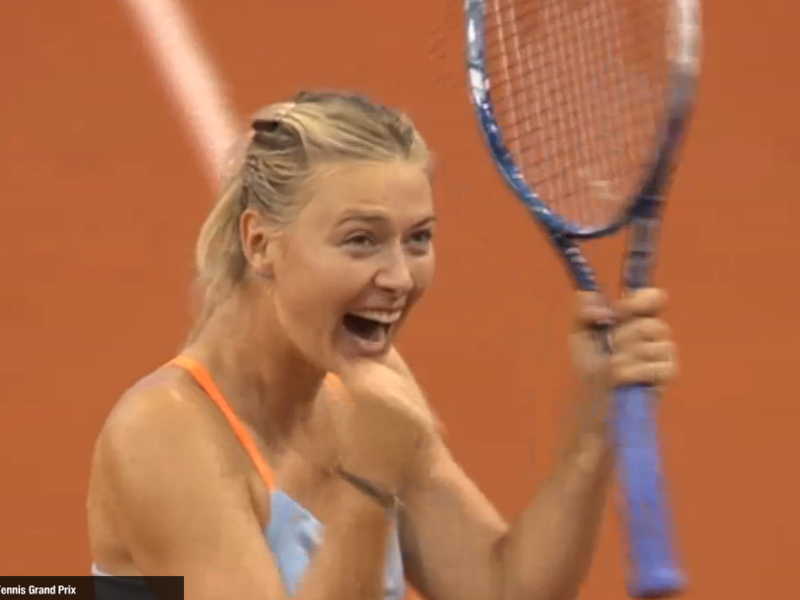 After I finished watching the match, I kept thinking that this Sharapova title march in Stuttgart reminded me of Rafael Nadal’s run to the Sao Paulo title, which was the first title of the Spaniard’s comeback. In Sao Paulo, Nadal was pushed to three sets more than once, and he was set to face a very tricky opponent in the fina. But that’s when Nadal lifted his play significantly and won without much drama in straight sets. Maria Sharapova faced much better opposition this week than Nadal did in Sao Paulo, but her struggles were well documented. Still, the current French Open champion found ways to get through her opening clay matches of the season, and once in the final, produced a remarkable display to take out a top player who had inflicted a painful defeat on her earlier in the season. There’s also something to be said about a very Key Point of the match: at 3-all in a tight second set, Maria Sharapova had a chance to secure a most decisive break. Li Na was very aggressive, and pushed Sharapova wide on her backhand side. Maria somehow got the ball back, but the Chinese No. 1 had a short forehand to put away. Here is where Li Na made the mistake that opened the door for Sharapova: instead of hitting behind Maria, she opted for a cross-court forehand. Sharapova had anticipated this shot, and produced a great forehand pass on the run that forced a volley error from Li Na. That point was a breathtaking example of just how well Maria Sharapova moves on a clay court these days (It still feels weird to type this).